Timeframe: Estimated at four (30-minute) sessions, 120 minutes total. This extension to the lesson offers students the opportunity to discover more about foodways, one of the most important types of material culture. Folklorists and other scholars who study cultures know that traditional foods are among the most highly regarded and longest lasting traditions of any ethnic group. 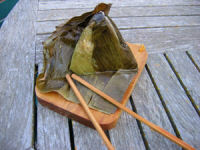 Families and many other types of folk groups cherish their traditional foods, as well. Students will learn more about the uses of traditional foods, compare similar foods in different cultures, and research traditional foods in a variety of ways in this lesson extension. Use proper interviewing, note taking, and recording techniques. Identify, research, document, and present to the class a recipe for a traditional food from a family member or from a member of another folk group in the community. Understand the importance of traditional foods in their own lives and the lives of others. Foodways cover not only the traditional foods of a culture, but also related knowledge, such as food gathering and harvesting techniques, food preparation methods, occasions at which the foods are served, and the manner of consuming the foods. Listed below are foodways traditional in Nebraska cultures and some of the occasions for which they are prepared. Other information about foodways can be found on the Internet and in the library. Descriptions and recipes for selected dishes are included in Recipes handout. African American - Ancestors of many of Nebraska's African Americans emigrated to Nebraska in the late 19th and early 20th centuries from southern states, such as Alabama, Missouri, and Mississippi. Therefore, Nebraska African American families enjoy many favorite traditional foods that are also popular in the southern U.S. These dishes have their roots in southern African American cooking, which was influenced by dishes from Africa and Europe, as well as by Native American food traditions. Examples of these traditional foods include sweet potato pie, black-eyed peas, peach cobbler, okra, cornbread, collard greens, and fried or barbecued meats and poultry. African American families and organizations serve these dishes on many occasions, from neighborhood picnics to family gatherings, church suppers and other celebrations. African - Nebraska has a number of newer residents from African countries, including Ghana. Nigeria, Senegal, Somalia, and the Sudan. Some of the common foods eaten in these countries are beans, cabbage, peanuts, yams, rice, citrus fruits, melons, peppers, plantains (bananas for cooking), potatoes, chicken, and fish. African cooks often combine these foods in spicy soups or stews and serve them with flat breads made from cornmeal or cassava (source of tapioca) flour. Traditional foods are a very important part of all community and family gatherings for these cultures. Some examples of traditional dishes include, Senegalese lemon soup, Sudanese peanut macaroons, and Nigerian boli (baked plantains). Asian and Pacific Islander - Asian American cultures represented in Nebraska include Cambodian, Chinese, Hawaiian American, Hmong, Indian, Japanese, Laotian, Pacific Islander, Thai, and Vietnamese. Rice is a staple throughout Asia and the Pacific. Other important traditional foods are fish and other seafood, seaweed, vegetables, chicken, pork, steamed dumplings, and noodles of many kinds. Some well-known Asian traditional foods include Chinese egg rolls and fried rice, East Indian curries and flat breads, Japanese sushi and tempura, Thai noodle dishes and coconut desserts, and Vietnamese Phou Bo (beef noodle soup) and spring rolls. Some of these traditional foods, such as egg rolls, and fried rice are more or less everyday fare. However some special dishes, such as Banh Tet (a large round, steamed rice cake made of sticky rice filled with pork and vegetables and wrapped in leaves, made traditionally to celebrate Tet, the Vietnamese New Year festival) take many hours of careful preparation and cooking. They are therefore considered special holiday treats. European (Eastern) - Many of Nebraska's early European immigrants came from the Slavic regions of Eastern Europe, notably Czechoslovakia, Slovakia, Poland, Russia and the Ukraine. After World War II, numbers of immigrants from the Baltic states of Latvia, Lithuania, and Estonia fled to Nebraska and other parts of the U.S., because of the Soviet takeover of their countries. More recently, Nebraska has welcomed refugees from Bosnia and immigrants from Russia and other countries that were formerly part of the Soviet Union. Many Nebraskans are familiar with Czech dishes, such as kolaches, roast duck, and sauerkraut with dumplings, because of the strong Czech heritage in our state. However, other less familiar traditional foods are made by Nebraskans, such as Russian and Ukrainian borscht (beet stew), Latvian kringle (coffee cake), Polish perogies (cheese or potato-filled noodle pockets), and Bosnian burek (meat filled pastries). European (Western) - The majority of Nebraska's earliest immigrant groups came from the western European countries, especially the British Isles, France, Germany and the Scandinavian countries. In fact, a large proportion of Nebraska's residents today claim at least partial ancestry from one of these countries. Many of our common regional foods, such as roast beef, steak, salads, puddings, cakes, pies, and cookies, originally came from one or more of these countries. Some examples of food traditions associated with specific counties include English muffins (crumpets), Irish stew, Scottish scones, Welsh tea cakes, German strudel, Germans from Russia broda (pot roast), French crepes, Italian spaghetti, Greek souvlaki (meat kabobs), German Mennonite pluma mous (fruit soup), Swedish meat balls, and Danish and Norwegian cookies. Latin American/Caribbean - By far the largest group of Latin Americans in Nebraska are Mexican Americans and Mexican immigrants from various states in Mexico. Other Latin American immigrants come from Central and South American countries, such as El Salvador, Guatemala, and Venezuela. Additional immigrants have come from Caribbean nations, such as Cuba and Jamaica. Some common traditional Latin American foods include tamales, tortillas, guacamole, horchata, Mexican hot chocolate, and salsa. Many of these foods are served as part of the everyday diet of Mexican Americans and other Latinos and also are part of festivals and celebrations of many kinds. Cuban picadillo (meat and vegetables over rice) and Jamaican rice and peas are two examples of common Caribbean traditional foods. Middle Eastern - Middle Eastern immigrants to Nebraska include substantial numbers of Afghans, Iraqis, and Iranians and lesser numbers from many other countries. Some common traditional foods from this area of the world include firnee (Afghani custard), hummus (a dip or spread made of garbanzo beans, also known as chickpeas), pita (pocket) bread, falafel (fried chickpea balls), and shish kabob. Native American - Four tribes currently have tribal headquarters in Nebraska, the Isanti Dakota (Santee Sioux Tribe of Nebraska), the Ho-Chunk (Winnebago Tribe of Nebraska), the Northern Ponca (Ponca Tribe of Nebraska), and the Umonhon (Omaha Tribe of Nebraska). In addition, members of other tribes either currently live in Nebraska or have resided here at some time in the past. These are the Oglala Lakota (Oglala Sioux), the Otoe-Missouria, the Pawnee, and the Sicangu Lakota (Rosebud Sioux.) Some of the common traditional foods made by all the Nebraska tribes include wojapi (berry pudding), fry bread, and corn soup. With the exception of fry bread, these foods are not necessarily everyday fare. Instead, Native Americans make them for powwows, naming celebrations, funeral dinners, honoring ceremonies, graduations, and other family and community celebrations. Begin the activity by showing photos of some of the favorite traditional foods from several cultural groups in Nebraska. Sample photos from various cultures are included under Images, and others may be found in newspapers and magazines. Share information or examples of any traditional foods you are familiar with, and ask students to discuss other food traditions they might have encountered through their families, community, or ethnic heritage. Have they seen, heard of, tasted, or made any traditional foods from other countries or ethnic cultures? Choose a person who is willing to be interviewed about and share a recipe for a traditional food. Do research on the traditional food before the interview, and write down a list of questions to ask, using the suggestions provided in class. Present a report (or other presentation) and copies of the traditional recipe to the class. The report should identify the history of the food(s), the culture(s) it comes from, and other significant information about it. Ask some or all of the students to report back to the class on the information they found about their chosen traditional foods. Initiate a class discussion comparing two similar traditional foods that come from different cultures. Do they have different ingredients, or uses? What is the significance of the foods to each of the cultures? Why do cultural groups preserve these food traditions? Alternative student projects are listed below. Attending a cultural celebration. Examples of celebrations that would be likely to feature traditional foods are Native American powwows, ethnic and religious holiday celebrations, community ethnic festivals, and traditional weddings. Field trip to an ethnic grocery, food specialty store, or bakery. Create a booklet or online "exhibit" of recipes and information about the traditional foods students researched. Traditional Food Fair: a special school event in which students, their families, and other community members bring in samples of traditional foods and share information and stories about the history of the foods and the occasions for which they are made and consumed. In this optional extension, students had the opportunity to learn more about traditional foods and the knowledge and skills that accompany them. They were able to research these traditions in depth, using interviewing, writing, and presenting skills. They also discussed similarities and differences between food traditions in different Nebraska cultures and learned about the importance of traditional foods in society. (8.2.5) By the end of the eighth grade, students will demonstrate the use of self-generated questions, note taking, summarizing and outlining while learning. (8.3.2) By the end of the eighth grade, students will use multiple presentation styles for specific audiences and purposes. (8.4.1) By the end of the eighth grade, students will identify information gained and complete tasks through listening. (12.6.1) Essential Learnings 6. Students understand connections between the arts and other fields of study. Click on the audio/video, once it opens up, right click and choose "save as" to download MP3 and MOV files. Video of a yearly traditional dinner held as a fund raising event by the Lincoln Nebraska Chapter of the American Historical Society of Germans from Russia (AHSGR). Video produced by Mike Keating and narrated by 5th grade student Katy Keating, 2003. Mexican American Foodways. An excerpt from a group interview with two of Mrs. Arsiaga's daughters and a granddaughter about her traditional cooking and how they are passing that knowledge down.